Modeling social-ecological interactions between humans and ecosystems to analyze their implications for sustainable management of social-ecological systems (SES) has multiple challenges. When integrating social and ecological dynamics, which are often studied separately, one has to deal with different modeling paradigms, levels of analysis, temporal and spatial scales, and data availabilities in the social and ecological domains. A major challenge, for instance, is linking the emergent patterns from individual micro-level human decisions to system level processes such as reinforcing feedbacks determining the state of the ecosystem. We propose building a hybrid model that combines a system dynamics with an agent-based approach to address some of these challenges. In particular, we present a procedure for model development and analysis that successively builds up complexity and understanding of model dynamics, particular with respect to feedbacks between the social and ecological system components. The proposed steps allow for a systematic increase of the coupling between the submodels and building confidence in the model before deploying it to study the coupled dynamics. The procedure consists of steps for (i) specifying the characteristics of the link between the social and ecological systems, (ii) validating the decoupled submodels, (iii) doing sensitivity analysis of the decoupled submodels with respect to the drivers from the respective other subsystem and, finally (iv) analyzing the coupled model. We illustrate the procedure and discuss opportunities and limitations of hybrid models against the background of an archetypical SES case study, namely the restoration of a turbid lake. Our approach exemplifies how a hybrid model is used to unpack SES complexity and analyze interactions between ecological dynamics and micro-level human actions. We discuss the benefits and challenges of combining a system dynamics models as an aggregated view with an agent-based model as a disaggregated view to improve social-ecological system understanding. Humans depend on many services provided by ecosystems such as food and clean water, nutrient retention, protection from flooding or recreational opportunities (MEA, 2005). At the same time human activities such as resource exploitation, construction or industrial production have altered ecosystems at and across all scales (e.g., Steffen et al., 2015). Approaches for understanding and sustainably managing ecosystems need to take these two way interactions between people and ecosystems into account (Berkes and Folke, 1998). Modeling, which is a widely used tool for ecosystem and natural resource management, thus has to go beyond studying humans as a simple driver of ecosystem dynamics or natural resources as a simple input to a production process by explicitly considering feedbacks between the ecological and social domains (Schlüter et al., 2012). Integrating human individual and collective behavior with complex ecological dynamics, however, comes with many challenges. These include amongst others the need to connect processes at different levels of aggregation used to represent the social and ecological systems, the different temporal and spatial scales, differences in data availability, as well as different modeling paradigms associated with different fields or levels of analysis. In this paper we present an example of a hybrid modeling approach that combines system dynamics with agent-based modeling to address some of these challenges. We present a procedure for the development and analysis of the hybrid model and discuss opportunities and limitations against the background of an archetypical social-ecological systems (SES) case study, namely the restoration of a turbid lake to a more desirable clear water state. Most commonly, lake management is investigated as an external intervention in the biophysical properties of a lake (Carpenter, 2005; Pers, 2005; Kara et al., 2011), rather than as the result of the interplay between ecological dynamics and social processes. Important social processes are decision making about ecosystem management measures and human activities that affect future states of the ecosystem. To understand the multiple drivers for lake restoration, it is necessary to analyze the lake management system as a coupled SES, where humans are embedded in the ecosystems they affect and depend on (Folke et al., 2005). One approach to take these interdependencies into account is to identify key social-ecological interactions that determine human responses and ecosystem change (Ostrom, 1990). Taking this perspective, we account in this study explicitly for responses of managers that monitor the lake state and regulate human interactions with the lake as well as decision making by actors whose behavior directly affects ecological dynamics of the lake. In doing so we face the challenge of linking emergent patterns from individual, micro-level decisions of humans to system level ecological processes such as nonlinear, reinforcing feedbacks determining the lake state in order to model individual and collective human responses to ecological change and vice versa ecological change resulting from human action. Different approaches have commonly been used to model these different social and ecological processes. The ecological dynamics of shallow lakes, particularly so called regime shifts that shift a lake from a clear to a turbid state, are commonly investigated as dynamical systems using analytical minimal models (Scheffer, 1989, 1990; Biggs et al., 2009) or simulation models (Carpenter et al., 1999; Mooij et al., 2009). Regime shifts are abrupt shifts in the state of a lake that persist over time. They are often caused by an external driver such as nutrient increases (eutrophication) that is amplified by ecological feedbacks (Scheffer, 1990). Dynamical systems can undergo a fold bifurcation which can be detected using bifurcation analyses to identify the range of driver values over which bistable behavior can be expected. Some systems show hysteretic behavior, which is when different stable states can be reached depending on the initial state. Existing minimal models of regime shifts in lakes show such hysteresis (Scheffer, 1990). The phenomenon can be explained by feedback loops that keep the lake system in either the clear or the turbid state. The moment that the driver crosses a threshold, the dominant reinforcing feedback switches and pushes the system into a different state. While these models are good at analyzing general system characteristics and important ecological feedbacks (e.g., Biggs et al., 2009) or aggregated effects from human decisions in land-use (e.g., Haase et al., 2012), they do not take into account potential human adaptive responses to changing ecological dynamics which may affect the regime shift or its reversal, e.g., through active restoration. They thus do not allow investigating particular social-ecological interactions such as the development of regulations as a macro-level response to ecological degradation or the lack thereof that may affect the dynamics of the whole social-ecological system. The social processes related to the use and management of ecosystem services such as monitoring, regulating, and enforcing new rules or adopting new technologies have not yet been modeled much in the context of SES. Traditional ecological models rarely take into account human decision-making (but see as an exception Janssen, 2001; Carpenter and Brock, 2004), despite its importance for management outcomes. Agent-based models (ABM) as they have been used in social simulation (Balke and Gilbert, 2014) as well as in land use (Janssen et al., 2000; Le et al., 2008) or marine sciences explicitly describe human decision making and range on a continuum from rather simple interactions among agents to deliberative/cognitive representations (see for reviews Bousquet and Le Page, 2004; Hare and Deadman, 2004). In ABM's, processes of decision making involving multiple factors are often implemented using sets of conditional rules, but optimization routines that determine the optimal choice under given constraints are also common. Fewer ABM's address multiple, organizational levels of human interactions and how macro-level social behavior emerges from micro-level interaction. In summary, building models for coupled social-ecological systems involve several challenges which comprise the explicit representation of feedbacks on multiple levels of aggregation and links between conceptually different subsystem models operating on different scales. One approach, that looks promising to us to address those challenges, is to develop and analyze a hybrid model in a stepwise approach to take advantage of different modeling paradigms. In this paper, we reflect on these particular steps and illustrate a potentially generic approach for social-ecological model analysis with the example case of lake restoration. The purpose of the stepwise procedure and the reflection upon the model development is to allow for (i) making explicit design choices related to the selection of the modeling approach for each subsystem, and (ii) rigorous testing of submodels using specific tools of each approach. The single steps also help to successively build up complexity of the model and its analysis for (i) systematically investigating the effect of feedbacks between the social and ecological systems, (ii) exploring the coupled model to build understanding for full model analysis. For the hybrid model, we propose combining system dynamics with agent-based modeling to link micro-level human action with system-level ecological dynamics. Such an integrated hybrid model allows studying social-ecological interactions over time to understand their implications for the future development of the coupled SES and its management. In this paper, we briefly review the two modeling approaches and suggest ways to combine them in practice. After introducing the case study, we present a stepwise approach to systematically develop and test a hybrid model. We illustrate our approach with a social-ecological model on the restoration of a turbid lake. The model has been developed to study the interactions between lake managers, private house owners, and a turbid lake to estimate the potential of improved sewage water treatment for lake restoration, where the aim is to better understand the critical time lags between social and ecological responses during the restoration process. We finally discuss the benefits as well as the conceptual and methodological challenges of combining an aggregated, system level with a disaggregated, agent-based modeling perspective. 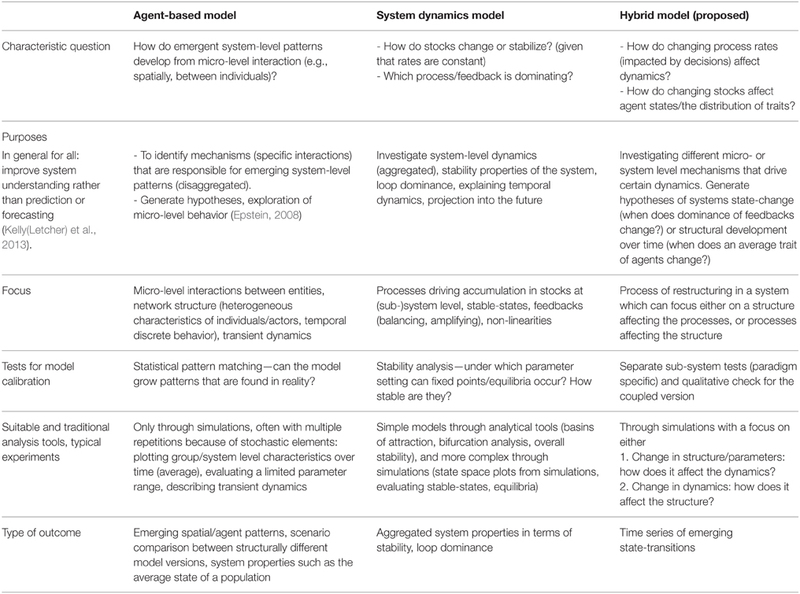 This section provides a brief overview of characteristics of agent-based and system dynamics models that were particularly acknowledged in the past (Table 1). The purpose is to identify both advantages and challenges of those approaches. The presented model paradigms are iconic in the way that they are often presented as exclusive alternatives to analyze complex systems either from a top-down/aggregate or bottom-up/disaggregate perspective (Vincenot et al., 2011; Swinerd and McNaught, 2012). Finally, we discuss examples how they have been or could potentially be combined in a hybrid model. Table 1. Characteristics of agent-based and system dynamics models, and how they can be combined within a fully integrated hybrid model. The choice of a modeling paradigm is primarily determined by the research question and objectives. Agent-based modeling is a common approach to study complex adaptive systems, i.e., systems that are characterized by self-organization, emergence and adaptation (Levin, 1998). ABM approaches generally focus on micro-level interactions that may explain emergent patterns such as transient dynamics on a system level. By this, one can identify which mechanisms are important, taking into account heterogeneity of entities, spatial and temporal heterogeneity of processes, and stochasticity. The output can be time series of system-level output variables, spatial patterns or the statistical analysis of system patterns that can be validated against empirical data. Rather than reproducing micro-level processes realistically, the aim in agent-based modeling is usually to simulate the minimum of necessary functions that are able to reproduce a certain system level behavior or pattern as an emergent outcome. While agent-based models are used to describe disaggregated parts of a system, system dynamics models represent the aggregated system in the form of stocks and flows. Here, the main focus lies on describing system-level behavior such as exponential growth through system -level structures such as feedbacks and non-linearities rather than letting the behavior emerge from micro-level interactions. Dynamics on the system-level are often represented by a set of differential equations and analyzed with the tools of dynamical systems theory. Here the aim is to describe the fixed points/stable states of the system (stability analysis) and identify how system structure drives system behavior (e.g., bifurcation analysis). System dynamics as a particular approach within dynamical systems applies causal-loop diagrams as a graphical approach to represent the main system-level interactions. This is usually done to investigate the nature of feedbacks (balancing, reinforcing) and estimate the overall dynamics of the system for example with stakeholders for policy analyses in environmental problem settings (van den Belt, 2004). It becomes necessary to implement the equations for the causal-loop diagram, however, to examine which feedbacks in the system are dominant and drive the development over time. Outputs are often stable states of the system, bifurcation diagrams or time-series describing system level behavior. Such simple equation-based models, so called minimal models, can still be studied analytically to identify system properties such as stability. For more complex analyses of both, system dynamics and agent-based models, simulations with varied parameters and multiple repetitions (in case of stochastic models) are evaluated to generate average system-level outcomes. These outcomes can be used to formulate new or more specific hypotheses that can be tested for instance with other model simulations. If a research question targets specifically the link between two parts of the system under study, it may be useful to define subsystem models and their interactions separately. Linking different subsystem models requires, firstly, specifying the particular variables, the aggregation level, and time scales that define the interface between subsystems. While the modeling paradigm suggests that agent-based models are rather suitable for representing the micro-level and system dynamics the system level processes, it does not mean that this order determines the way that they are connected (Swinerd and McNaught, 2012). There exist multiple ways to combine different types of simulation models ranging from subsequently coupled (such as in Gaube et al., 2009) to dynamically coupled (Shanthikumar and Sargent, 1983; Swinerd and McNaught, 2012). Often, a system dynamics representation is chosen to simulate internal processes of an entity while the interaction among entities is mapped via an agent-based approach (Bradhurst et al., 2015). In other cases, processes on the system level affect individual entities top-down (downward-causation) and in turn interacting individuals have emergent properties that play out on the system level (e.g., Haase et al., 2012). We present a hybrid model herein (Section A Stepwise Approach to Develop, Test and Analyse a Hybrid Social-ecological Model) where the two subsystems can be presented side-by-side with a dynamic feedback between them. Regime shifts in shallow lakes from the clear to the turbid state are typically driven by an increase of nutrient inputs into the lake from streams, channels and groundwater. The affluent availability of nutrients, in particular phosphorus, enhances the growth of planktonic algae, which reduces light penetration and thus causes submerged plants to disappear that dominate in clear waters. The density of algae also depends on the presence of its predator zooplankton and their predator whitefish such as bream (Abramis brama L.). A typical turbid lake is characterized by high densities of planktonic algae, low zooplankton biomass and diversity, high abundance of whitefish, a low density of piscivorous fish (such as pike—Esox Lucius L.), and reduced amounts of macrophytes (Ekvall et al., 2014). Conversely, a clear lake contains limited algae, a rich and diverse zooplankton community, few whitefish, a higher density of pike and macrophytes. A range of minimal models exist that are able to reproduce lake regime shifts that originate in different parts of a lake's foodweb (Scheffer, 1990). While the causes for those regime shifts are often diffuse, accumulated over long time, the consequences appear relatively abrupt, are clearly visible and affect multiple ecosystem services (Biggs et al., 2012b). For the case of lakes, multiple actors potentially contribute to eutrophication, namely farmers using fertilizer for agriculture, municipal sewage treatment plants, and private house owners who are not connected to municipal sewage treatment. Through the water framework directive in the EU, particular rules for fertilizer use in agriculture and sufficient purification procedures for sewage water were formulated which reduced inflow from agriculture and commercial sewage treatment plants. However, single house owners were not much addressed before as their contribution to nutrients in water catchments was not seen as significant as today. Recent evidence, however, shows that in some regions such as the Baltic Sea untreated sewage water from private households (mainly holiday homes) can be a major polluting source (Kininmonth et al., 2015). The decision is made by individual house owners about whether to upgrade their private sewage system to withhold more of the nutrients. This decision can be influenced by cost-benefit considerations, the presence of sanctions such as fines, or social considerations, such as social norms or social pressure within a social network. Individual house owners, for example, are obliged to invest into a private, legal sewage treatment system, but the benefits therefrom are communally shared, probably lag in time and are difficult to see which incites to delay the private investment. The way how house owners are informed and connected among them plays a crucial role in the catchment-wide adoption of sewage treatment upgrades (Wallin, 2012). To drive a desired regime shift in the lake from the turbid to the clear state, multiple stakeholders (municipalities, farmers and responsible persons for sewage water treatment) are required to take effective and coordinated action. Here, we present our general stepwise approach of developing and analyzing a hybrid model representing a SES (Figure 1). Developing one of the submodels might involve a model development cycle in itself (Schmolke et al., 2010) but here we focus solely on considerations for coupling existing submodels that build on different paradigms or operating on different aggregation levels. The same accounts for results of analyses of the decoupled subsystems which for the purpose of this coupled model are elements of the model building process. We consider the outcomes from the coupled model that answer our research question about the impact of social time lags for lake restoration our model results. Figure 1. Main steps for developing and analyzing a hybrid model for a SES. The first step starts on the conceptual level with the aim to identify the main social-ecological interactions in the target SES that need to be defined for the hybrid model. This includes a specification of the links between the ecological and social systems, as well as the submodels representing each of the subsystems, their aggregation level, temporal, and spatial scales. From those specifications, one can also derive which modeling paradigm is suitable to represent each submodel. The second and third steps are performed for each submodel separately and involve tests to verify or validate the submodel by itself and with respect to the other model it will be coupled with. Step two can involve a newly developed or an existing model that is now adapted and analyzed for the purpose of the hybrid model. Adapting an existing model might involve a transfer of the model to a different modeling environment and tests of characteristic submodel behavior. For step three, we propose a sensitivity analysis for expected parameter changes that might become relevant when coupling the two models. So, each submodel is tested for its behavior driven by the output expected from the other respective submodel (but without a feedback to the other model). This provides a better understanding of one-directional influences before the feedback between submodels is fully integrated. The final step four goes back to the fully integrated social-ecological view and explores the behavior of the coupled model implementation. Prior submodel analyses can be very helpful to interpret results from the fully implemented feedback. To illustrate the proposed steps, the remaining parts of this section present the actual description and analysis of our hybrid model on lake restoration. Thus firstly, we provide an overview on the model structure including the links between the social and ecological systems, assumptions, scales, and the included processes (Step 1). Secondly, we focus on the ecological submodel and reproduce an existing minimal lake regime shift model using the tool Matlab Grind to identify stable state values for the fish populations and the critical nutrient levels (Step 2b). These are used to test the reimplementation in NetLogo, an environment that is capable and comfortable for developing agent-based and system dynamics models. Note that in our case for the social submodel this step (2a) is less relevant because we build on a model that has already been developed in a SES context (Tavoni et al., 2012). The social submodel testing therefore takes place mainly in step 3a. Thirdly, we test the behavior of both submodels with respect to changing drivers from the other respective submodel (Step 3a and b) and finally, we explore the coupled model (Step 4). The purpose of our hybrid model (“LimnoSES,” stands for “limnological social-ecological system”) is to investigate human responses to a turbid lake that might promote or delay a desired regime shift back to the clear state. The shift from a clear to a turbid state has been frequently described and analyzed (Scheffer, 1990; Carpenter and Brock, 2004; Mooij et al., 2009) but the decisions and social processes that are necessary for lake restoration have been much less investigated. We aim to get a better system understanding about the relevant social-ecological interactions and therefore develop submodels for the social and ecological subsystem respectively. 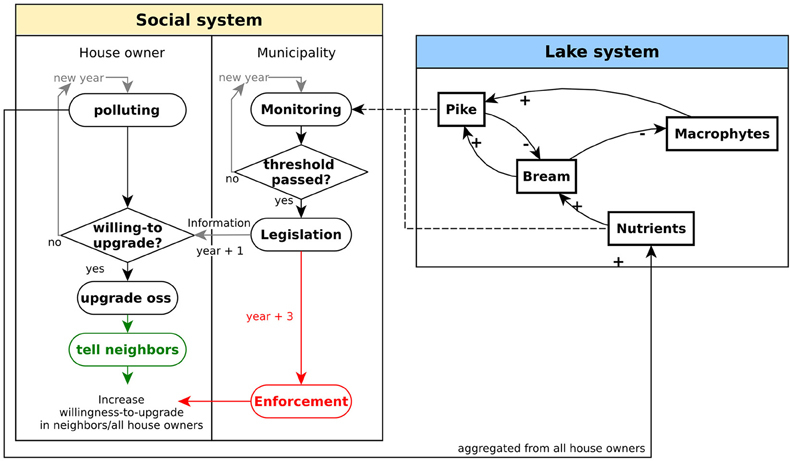 The social-ecological system of lake management as modeled in LimnoSES consists of a lake subsystem and a social subsystem that are connected through two social-ecological interactions Figure 1 Main steps for developing and analyzing a hybrid model for a SES. Figure 2 One interaction is the monitoring activity where the responsible authority oversees regular measures of indicators of the state of the lake. They report annually data on water quality, nutrients, composition and density of planktonic algae, amount of fish and submerged plants (macrophytes). For the purpose of this model, we chose the density of pike as a system-level indicator of the lake's state because it is also a commercially interesting fish species. As only the aggregated number of fish rather than individual pike characteristics play a role in determining the lake state, this gives a first indication for the suitability of a system dynamics perspective for the ecological submodel. Figure 2. Conceptual graph of our hybrid model with the social system represented by a flow chart and the lake system by a causal-loop diagram. The subsystems are connected via the monitoring of the municipality and the nutrient release from private house owners with insufficient onsite-sewage systems (OSS). The colored processes for the social actors show optional, additional responses that are explored and compared in our model analysis. The second interaction is the pollution of the lake caused by insufficient treatment of sewage water from private house owners in the catchment. We assume that the increase of nutrients in the lake in the past was mainly caused by fertilizer use in agriculture and historically insufficient municipal sewage treatment. But since the use of fertilizer has been regulated and municipal sewage treatment has been technically upgraded, private house owners and their aggregated impact have now a significant influence on lake nutrient levels. They are thus important actors to decrease today's nutrient input to the lake by upgrading their onsite-sewage systems (OSS) (Wallin et al., 2013b). Before the aggregated impact from private sewage treatment affects the lake, house owners decide individually whether or not to upgrade their private system and their decision is for instance influenced by the current legislation. These two levels of individual and collective social processes indicate that an agent-based perspective is suitable for the social submodel. Starting from the focal social-ecological interactions, we determined which entities and processes need to be represented in the ecological and the social submodels in order to model the restoration process. The ecological submodel, for which we choose the minimal model by Scheffer (1989), represents two fish populations, namely pike (piscivore fish) and bream (whitefish) which interact as predator and prey respectively. The fish populations are also influenced by the amount of nutrients and macrophytes in the lake. The minimal model operates on a daily time scale and shows bistable behavior for the fish densities in response to present nutrient amounts. The causal-loop diagram for this minimal lake model (Figure 2, right) consists of two feedback loops. 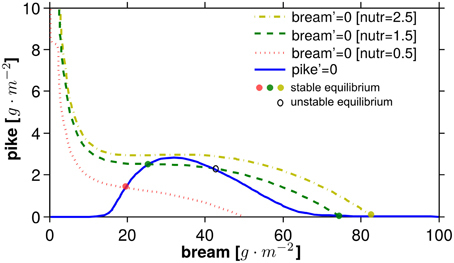 A balancing loop describes the predator-prey relationship between pike and bream which enables these two populations to equilibrate around a stable state. The reinforcing loop that connects pike and bream via the amount of macrophytes can on the other hand force the two fish populations away from the stable state they were previously in. These two feedback loops are the main structural elements that enable bistable behavior of the lake system and therewith regime shifts between two stable states. The problem of OSS upgrading of individuals in the community for the benefit of all represents a social dilemma where individual and collective benefits are not aligned and the incentive to free-ride and not contribute to the public good of a clean lake is high. There is a rich literature and many models exploring possible mechanisms that enable cooperation for achieving the socially optimal outcome. The development of the social submodel has been inspired by the model of Tavoni et al. (2012) which investigates the role of social disapproval for successful cooperation. We explore two different mechanisms of how this willingness to upgrade could be influenced based on evidence from a recent survey among Swedish house owners (Wallin et al., 2013b). When confronting house owners with the request to upgrade their sewage system, they find themselves in a high-cost low-benefit situation. As a consequence, house owners tend to avoid timely upgrade of their OSS and the question is how their decision to upgrade can be supported. In some cases, inspectors were sent out by municipalities to check the current installation and support upgrading by reminding house owners about their legal obligation (“central enforcement”). But in many municipalities, inspectors could not be afforded and successful OSS upgrade was found to depend on horizontal information exchange among house owners and their trust in the governance system (“social engagement”). The general schedule of how the two submodels are implemented, linked and processed is as follows. Each model year starts with the calculation of the aggregated release of nutrients by the house owners. The amount of nutrients is used to drive the daily dynamics of the fish and macrophyte densities. Once a year, the nutrient level in the lake is monitored by the municipality. If the threshold is crossed, the municipality initiates a process of legislation and informs all house owners in the following year about a new regulation that requires the upgrade of their OSSs. Depending on the house owners' willingness-to-upgrade, they upgrade their OSS and therewith eventually stop releasing nutrients into the lake. Two alternative mechanisms are assumed that potentially increase the house owners willingness-to-upgrade, one is through horizontal enforcement (“social engagement”:“tell neighbors” in Figure 2) among house owners and the other through vertical enforcement from the municipality (“central enforcement”: “enforcement” in Figure 2). More details on the model description can be found in the Supplementary Material where we used the protocol ODD+D that was specifically designed to describe human decisions in agent-based models (Müller et al., 2013). Our hybrid model simulation fully couples the agent-based and system dynamics submodel with a sustained feedback on the system level in both directions which can be called an integrated hybrid simulation (Swinerd and McNaught, 2012 or class II-type after Shanthikumar and Sargent, 1983). Thus, former external drivers of the submodel, such as the nutrient flow, became integrated and result from the aggregated decisions of individual house owners. LimnoSES was implemented in NetLogo (Figure 3). Figure 3. Part of the graphical interface from our “LimnoSES” implementation in NetLogo showing in the main visualization panel house owner agents on the left side and representative agents for the fish stocks on the right side. Buttons, sliders, information boxes and diagrams are used for testing single scenarios before they were executed in a batch mode for the analyses. The lake submodel consists mainly of two differential equations that are able to reproduce shifts between a clear and a turbid state indicated by the pike/bream-relationship (Scheffer, 1989). The densities of the two modeled fish populations span a state space for this ecological submodel. Typical patterns for regime shifts are bistability in the state space and hysteresis, which should be reproduced by the ecological submodel and are relevant for the analysis of our hybrid lake model. The stability analyses are usually performed on continuous model implementations. Within our hybrid model, however, a discrete representation is required because of discrete events in the social system. We calculated the values for the stable states of the continuous lake submodel at different nutrient levels in order to use them later to verify the discrete implementation. We implemented the given equations and parameter settings in Matlab Grind1 to visualize the stable states within a state-space diagram. Depending on the nutrient level, the zero-isocline of bream has different positions and determines whether the lake system has one or two stable states (Figure 4). For the bistable case, one state shows a very high density of bream with a very low density of pike which represents the undesired state where the lake is turbid. The desired state instead has a lower bream density and a relatively high pike density. This analysis also shows that the desired state cannot be reached if the nutrient level is too high. The stable state values for the clear water stat (high pike density) and turbid stat (low pike density) are later used to initialize a lake eutrophication or restoration scenario respectively. Figure 4. State-space diagram showing zero-isoclines for bream and pike with different stable states depending on the nutrient level that influences the position of the zero-isocline for bream. The zero-isocline for pike is unaffected by the nutrient level. Reimplementation is based on the model developed by Scheffer (1989). Another convenient tool to investigate system-dynamics models within Matlab Grind is a bifurcation analysis to determine the parameter range for driver values (here: nutrients) where bistability can be expected. The values for the stable states together with the parameter range for nutrients allow us to formulate and test hypotheses about the expected behavior of this model when it runs in a different implementation. So, for instance, at a nutrient level of 1.5 (dimension-less), stable states can be expected around a population density of 25.8 g·m−2 for bream and 2.6 g·m−2 for pike in the clear state and at 84 g·m−2bream and 0.04 g·m−2 pike in the turbid state. The hysteretic behavior of fish densities in response to nutrients ranges between 0.9 and 2.1. This means that, above this range, the lake system ultimately runs into the turbid state, whereas below this range, only the clear state is reached. Within the bistable range of nutrients, it depends on the initial values of pike and bream whether the lake runs into a clear or turbid state. We decided to implement the prototype of our hybrid model in NetLogo since the main interest in this study is to test different mechanisms of human decision-making in response to the lakes state. 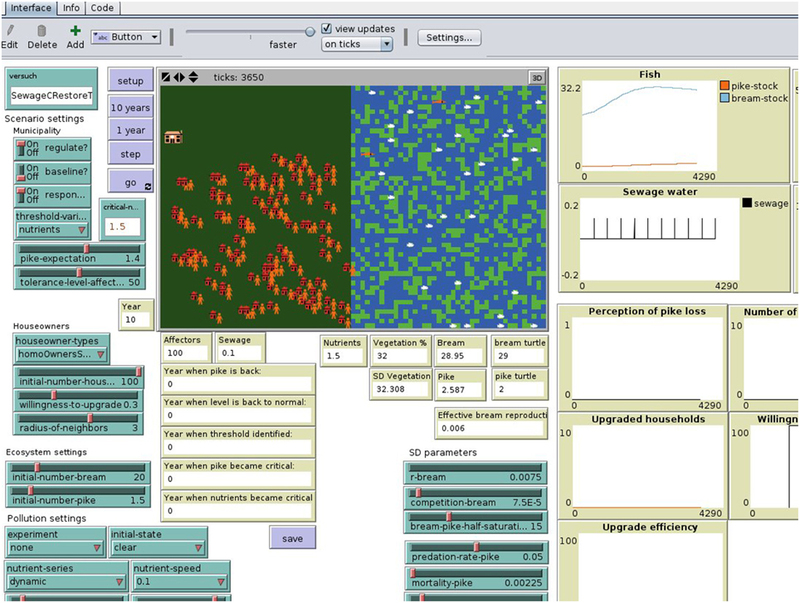 This environment is primarily designed to implement and test agent-based models but it has an interface to implement system dynamics models as well. But since the numeric representation of such models is always discrete, we had to test the suitable step size, meaning the respective time scale, at which bistability and regime shifts between those states can be reproduced. - Can bistable behavior be reproduced?—Yes, increase or decrease in nutrients respectively cause the fish stocks to run into different states. - What are suitable initial states for fish populations to stay in the clear or turbid state? Does the time-scale (annual, daily) play a role?—While the time scale is not relevant for continuous models, it actually has an effect in time discrete simulations. Although the original model operates with parameters on the daily time scale, we checked whether it is possible to transform it to an annual scale to simplify the link to the annually operating social submodel. But, the annual scale for the system dynamics was found to limit the initial conditions that are suitable to lead to the clear state considerably. The daily scale was chosen to be more suitable thereafter as the state space for fish stocks was more equally divided between the clear and turbid state. Since the coupled model is intended for the investigation of changing nutrient values affecting the lake state, we are particularly interested in the transient dynamics. This is in contrast to a common bifurcation analysis where simulations run with constant parameters until a stable state is reached. We aim to explore the transient dynamics in the ecological submodel caused by in- or decreasing nutrient values because lake managers are confronted with situations where transient dynamics may cause different outcomes in terms of the lake state. We also want to estimate in what way the response time of house owners to upgrade their sewage system may affect nutrient change and therewith the lake state. For the following experiment, we run scenarios of nutrient increases at three different rates and respective time spans (10, 20, and 40 years) so that they end at the same nutrient level. We selected three suitable nutrient end levels which were right below, in the middle and above the hysteresis range (Figure 5, left) For this experimental setup, we expected that simulations with the highest nutrient level result in the turbid state and simulations running to the lowest nutrient level at the clear state. But it was unclear how the outcome will be when the medium nutrient level is targeted. The result confirms that under a low and high nutrient regime, the lake reaches a clear and turbid state, respectively, independent from the rate of nutrient changes over time. The lake reaches a clear state once the nutrient level is below the hysteresis range, as indicated by bream and pike densities in the state space (relatively high pike and low bream densities, Figure 5, right). Further, the lake reaches a turbid state once the nutrient level goes beyond the hysteresis range independent of the rate of nutrient change. In contrast to these extreme scenarios, the medium nutrient level scenario shows that the end state of pike and bream densities can also depend on the previous rate of nutrient increments. The highest rate caused the fish populations to end in the turbid state, while lower rates enabled leveling off into the clear state. Figure 5. Left: Nutrient time series as driver for scenarios, at three rates (speed: slow, medium, high), and three different destination levels (end: low, medium, high), showing results from nine simulations in total. Right: The resulting fish populations in the state space. At the lowest nutrient levels, the resulting fish state is independent of the rate of change. But in the intermediate nutrient level, fish populations driven by the fastest increase (red) experience pike reduction while at slower rates pike increases can be observed. At the highest nutrient level, all fish simulations result in the low-pike-state. The rate dependent behavior in transient simulations extends previous equilibrium analyses that solely examined stable states. The rate dependent shift to another basin of attraction was called r-tipping before (Ashwin et al., 2012) but it is much less recognized than bifurcation or driver related tipping points. Interestingly, we could not find this rate dependent behavior in an experiment where nutrients were reduced in the same way as they were increased in this experiment, which would simulate the restoration process at different rates. Since we had no particular pattern to test our social submodel against, we explored the general effect from three potential response scenarios of house owners that need to upgrade their sewage system. To this end, all house owner agents were initialized homogeneously with a value for their willingness-to-upgrade. We compared scenarios of homogeneous house owners without interaction among them as a baseline with two scenarios that describe social interactions with which the initial willingness-to-upgrade can be increased over the simulation time. For the baseline scenario, the rate is static with which house owners upgrade their OSS. In the “central enforcement” scenario it is assumed that, after a fixed time lag following the municipal legislation for upgrading OSS, inspectors visit individual house owners which promotes the individual willingness-to-upgrade. In the “social engagement” scenario, we assume that direct knowledge exchange with neighbors and the house owners sense of responsibility to follow the law improves the willingness-to-upgrade (Wallin et al., 2013a). So, house owners are more likely to follow the example of their neighbors who already upgraded their OSS. From this assumption follows that at low values for the willingness-to-upgrade, upgrading activities will take off quite slowly before they accelerate and reach every house owner. But at higher values for the willingness-to-upgrade, a much faster upgrade by all house owners can be expected. In contrast to this scenario, the “central enforcement” scenario explores how after a fixed time lag (assumed as a buffer time before a municipality finds time and resources to check the implementation of the new law) all house owners are inspected which is assumed to increase their willingness-to-upgrade. In Figure 6 we present the average time lag between the year that house owners were informed about new sewage water regulations and the year that they actually upgraded their sewage system. We aggregated the individual responses and show only the average time lag for the total population in each scenario. 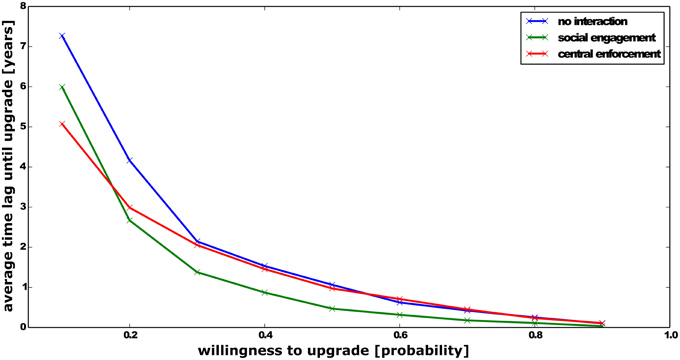 Along the x-axis with increasing values for the willingness-to-upgrade, the time-lag for OSS upgrade decreases exponentially in all three scenarios as expected. But further, the scenario comparison revealed that the “central enforcement” worked best, in terms of a short time lag, for a house owner population with an extremely low willingness-to-upgrade in the beginning. But as soon as this initial willingness was higher, “social engagement” performed better in terms of lowering the average time lag to upgrade. Figure 6. Three scenarios showing the aggregated, average time that is necessary for private house owners to upgrade their sewage system over a range of initial values for “willingness-to-upgrade.”. To analyze the coupled simulation model, we explored how the ecological and the social system respond to each other in terms of time lags that emerge from their respective dynamics. The purpose of this experiment is to relate the time necessary for ecological restoration (in terms of sufficiently high pike densities) to the preceding time lag in human responses to critical nutrient levels (through legislation and upgrades of private sewage treatment). For the ecological time lag, we calculated the time interval between the year when pike first drops below the expected threshold and when pike returns to levels above this threshold. As in the previous experiment, the social time lag is calculated as the interval between the detection of a surpassed nutrient threshold and the time step when the house owners, in average, upgraded their OSS. From previous experiments with the decoupled models, we expect that for low values of willingness-to-upgrade, the social time lag is lowest for the “central enforcement” scenario. 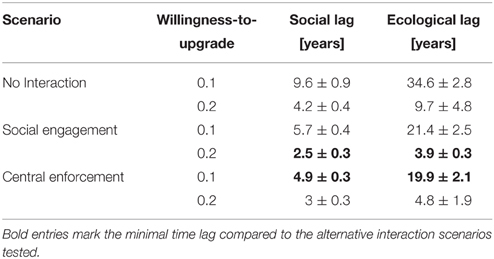 In contrast, higher willingness-to-upgrade values are expected to be more effective in the “social engagement” scenario to result in short social time lags. We further hypothesize that ecological time lags increase nonlinearly with increments in social response lags due to the reinforcing feedbacks identified in the lake system. Results shown in Table 2 confirm those hypotheses. The mechanism of central enforcement seems to be effective to shorten social responses to critical nutrient levels under conditions of low willingness-to-upgrade among house owners. Contrasting to that, the mechanism of social engagement is more effective when the initial willingness-to-upgrade is slightly higher. The relation between social and ecological time lags reveals that under all scenarios increases in the social time lag causes a multiple increase in the time lag for ecological restoration. Table 2. Calculated time lags from simulations under different scenarios. Analyzing complex social-ecological systems is often approached with models that need to deal with multiple sources of complexity: two-way interactions or feedbacks between the social and ecological systems, processes on multiple scales, links between different levels of aggregation, and emergent as well as downward-causation processes. To tackle those challenges, we proposed a stepwise approach to develop and analyze a hybrid model that links micro-level human behavior and system level ecological dynamics with the aim to systematically investigate two-way social-ecological interactions. Using our hybrid model as an illustrative example, we focus here on the conceptual and methodological challenges of combining an agent-based and a system dynamics modeling approach to explore social-ecological interactions and outline the advantages therefrom. Agent-based and system dynamics models were often viewed as antagonistic approaches to represent complex systems as they operate at different levels of aggregation and capture different, complementary aspects of the system under study (Parunak et al., 1998). Recently, the common and synergistic features were highlighted for coupled ecological models (Vincenot et al., 2011) but implementations of different types of submodels in one integrated model are rare and mainly in single domains (see for examples Hudjetz et al., 2014; Bradhurst et al., 2015; Vincenot et al., 2015). Here, we want to stress how beneficial it is to couple agent-based and system dynamics models in a hybrid model to investigate SES particularly for bridging between such distinct domains as ecology and society. It was acknowledge before that ecosystem models need to integrate more aspects of complexity (Gray and Wotherspoon, 2012) but we found that a general strategy to build coupled models for SES that helps navigate the increasing conceptual and analytical complexity was lacking so far. To not reinvent the wheel, it is of great help to build on already existing and fully analyzed models in specialized domains (Mooij et al., 2010), choosing carefully among available approaches (Kelly(Letcher) et al., 2013), and follow established procedures for document their development and application (Schmolke et al., 2010; Müller et al., 2013). Building on this valuable literature, we propose a procedure to couple agent-based and system dynamics models to explore SES. Dividing hybrid model development and analysis tasks into distinctive steps as outlined in our procedure proved useful to approach system complexity incrementally and we reflect on this procedure with illustrations from developing a model on lake restoration. 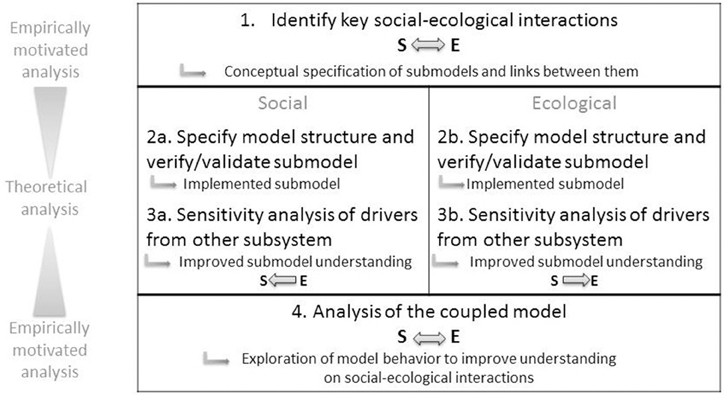 To start the conceptualization and development of a coupled model representing a SES, we consider the identification of key social-ecological interactions that explain the phenomena of interest, e.g., the restoration of shallow lakes, as a helpful way to identify the main links between the social and ecological subsystems. It further helps to specify the research question and draw suitable system boundaries. In specific, we focused on how authorities monitor the lake and respond to the turbid state through regulating private installations for sewage water treatment. Those social-ecological interactions relate to specific aggregation levels (e.g., the community, individual house owners, turbidity of the lake), temporal and spatial scale (e.g., daily/annual), occur in response to certain events or trigger other processes. Those considerations help to draft first submodel characteristics, expected submodel patterns or behavior, and their boundaries to finally select a suitable paradigm for the submodels. If the pattern of interest is homogeneous, deterministic and aggregated over space and entities, representation through an average, system-level value for this characteristic might be sufficient. But in case individual processes depend on historical or environmental context, stochastic events and local interactions of heterogeneous entities, they are better represented by an agent-based approach. Translating an agent-based model version into a system dynamics version and vice versa can help to identify the sensitivity of outcomes toward the implemented modeling paradigm (Wilson, 1998). We suggest that the choice of modeling paradigm should be an informed decision taking the research question, system characteristics, and the expected outcome into account asking e.g., whether heterogeneity matters for the research question. Rather than striving to represent every process within a single paradigm, we argue here that in some cases a greater system understanding can be achieved when combining different types of submodels and using the traditional, specialized analysis tools that are available for the respective approaches. In our case, ecological lake dynamics were modeled on the systems level at a daily time scale and the social processes were based on micro-level decisions and operated on an annual time scale. Linking those contrasting submodels can be done in multiple ways (Swinerd and McNaught, 2012): (i) the link can be uni- or bidirectional, (ii) system level variables effect individuals in the same way or differently, (iii) individuals affect system variables individually or aggregated. For instance, fishing can be done by individual fishers with specific strategies on a fish population that is modeled on the aggregated system level. The polluting activity in our case, however, is rather an aggregated, collective impact from individual house owner decisions on the lake's system level. We identified three general model design questions that can support the choice of how to specify and link the required submodels: (i) are submodel processes best described continuously or discrete? (ii) which different time scales apply in the submodels to be coupled?, (iii) is the overall model outcome expected to analyze transient or stable state dynamics? For step two in our procedure, we asked for submodel verification to reproduce characteristic model behavior or patterns within a given model paradigm and potentially a validation against empirical data. Using existing, fully analyzed models as submodels is desirable but great care is necessary for transferring them into a new context and probably a different implementation environment. Examples exist for how this can be achieved for system dynamics and agent-based models (Macal, 2010) but it seems to be rarely done for SES models so far. For step three, we explored the behavior of each submodel with respect to drivers expected as output from the other respective submodel (but without a feedback to the other model). For the lake model, we analyzed the stable states at different rates of gradual nutrient increases (Figure 4). They led to different stable states than those obtained from common bifurcation analyses (Janse et al., 2008), which proved that not only the absolute value of the driver but also its transient dynamics can determine the lake state. This corresponds to previous tipping point analyses with analytical models where different mechanisms causing regime shifts were described (Ashwin et al., 2012). Our example shows that the choice between analyzing equilibria or transient dynamics can result in qualitatively very different outcomes. This has implications e.g., for models that aim to provide estimates of critical nutrient loadings for lake managers (Janse et al., 2008) and supports the argument that multiple modeling approaches are required to create an integrative view on system dynamics (Mooij et al., 2010). Unfortunately it is often the case for SES models that data and knowledge on the social subsystem structure and dynamics are much more limiting than for the ecological subsystem. It therefore becomes crucial to determine the robustness of model results to model assumptions and parameterization. This should include testing for structural uncertainties such as different mechanisms for human decision making. Our analysis of the “central enforcement” and “social engagement” scenarios showed that the mechanisms of how rules on sewage treatment are implemented determine the social response time to critical lakes states. Empirical evidence on the actual duration of policy making and adaptation of new rules is important to make these model processes more realistic. Insights from theoretical models that study prototypical social situations such as commons dilemmas such as the one underlying human individual and collective behavior in our lake restoration case can also be valuable starting points to identify relevant social mechanisms. During the hybrid model analysis in step 4, we encountered two challenges that particularly relate to agent-based and system dynamics implementations. One mechanism that is crucial to understand for managing regime shifts is the switch of dominant feedbacks in the system. This can hardly be analyzed in the coupled model implementation that is based on simulation outcome. Here we suggest an iterative procedure of comparing experiments using traditional analysis tools for dynamical systems (as we exemplified with stable state and bifurcation analyses in step 2) with systematic time series analyses from the coupled model (step 4). This allows a step-wise selection of relevant parameter ranges and specifying further hypotheses. Current challenges of developing models to improve understanding of coupled SES involve the integration of existing models without “reinventing the wheel” (Mooij et al., 2010) and combining multiple levels of aggregation (Schlüter et al., 2012). We have integrated a minimal model that was studied extensively before (Scheffer, 1989) into a hybrid model which clearly supported the interpretation of results from the coupled model simulation. Particularly the assessment how feedback loops take effect, which is the special focus in system dynamics models and may become hidden in coupled simulations, enabled a better understanding of why time lags in the social system can be amplified through ecological dynamics. We observed in those scenarios that delays in the social response to the turbid lake state can increase the time for potential restoration of the clear lake in a non-linear way. While this exemplifies the added value in generating system understanding from a system-level perspective, we also found benefits from integrating the micro-level for social processes. To improve the relevance of models for supporting environmental decision-making and increase trust in scenario simulations, it is crucial to link model outcome to empirical patterns (Grimm et al., 2005). But since empirical evidence for individual decisions on the adoption of new sewage treatment technologies are still lacking, the response time for lake restoration cannot simply be subsumed under one parameter. The agent-based approach for the social submodel revealed the sensitivity of the outcome, here the lake restoration time, toward these micro-level decisions. We further believe that the integration of existing models and particularly the development of hybrid models strongly benefits from their documentation with broadly applied protocols (Müller et al., 2013, 2014). These comprehensive documentations increase awareness about alternative model design options and support reasoning about the underlying assumptions more explicitly. This is particularly relevant if the process of developing models becomes an interdisciplinary activity. Models of social-ecological systems do not necessarily have to be developed such that the ecological part is represented by system dynamics and the social part by an agent-based approach. However, such a separation suits well as an illustrative example where the benefits of using a hybrid approach become particularly visible. Social-ecological systems research uses multiple perspectives and multiple methods in order to understand the complexity of these systems and develop integrative approaches (Ragin, 1987; Poteete et al., 2010; Biggs et al., 2012a). Specific modeling approaches that emphasize either micro-level interactions that lead to system level patterns or aggregated, system level processes are commonly used. Of special interest are models that create a better understanding of alternative stable states (Scheffer et al., 2009) and transient dynamics in social-ecological systems (Schlüter et al., 2012). We propose that a hybrid modeling approach enables a “multi-scopic” view on the system, integrating micro- and system level processes and a broader set of analytical tools. Beyond that, it encourages the modeler to reason and be more explicit about the model assumptions and its suitability for the purpose of the study. Developing and combining alternative representations can lead to a more in depth and nuanced understanding of a given phenomenon taking multiple possible explanations and methods into account (Poteete et al., 2010). This, however, requires a greater flexibility in the tool use by model developers. Finally, through the integration of existing minimal, equation-based models, with an agent-based approach, it is possible to link theory to empirical patterns that are currently explored on social-ecological research frontiers. With our presented procedure to model interacting system- and micro-level processes, we hope to motivate more hybrid models being developed and analyzed for social-ecological research. We are very grateful for insightful comments on the earlier manuscript from our colleagues Steven Lade, Nanda Wijermans, and Björn Schulte-Herbrüggen. The comments by two anonymous reviewers and editor Christian E. Vincenot are very much appreciated and helped particularly to sharpen the focus and structure of the paper. RM and MS acknowledge support from the EU-project LIMNOTIP funded under the FP7 ERA-Net Scheme (BiodivERsA, 01LC1207A), MS acknowledges funding by the European Research Council under the European Union's Seventh Framework Programme (FP/2007-2013)/ERC grant agreement no. 283950 SES-LINK and a core grant to the Stockholm Resilience Centre by Mistra. Berkes, F., and Folke, F. (ed.) (1998). Linking Sociological and Ecological Systems: Management Practices and Social Mechanisms for Building Resilience. New York, NA: Cambridge University Press. Biggs, R. O., Thorsten, B., Carl, F., Line, G., Albert, N., Magnus, N., et al. (2012b). “Regime Shifts,” in Encyclopedia of Theoretical Ecology, eds A. Hastings and L. Gross (Ewing, NJ: University of California Press), 609–617. Macal, C. M. (2010). “To agent-based simulation from system dynamics,” in Proceedings of the 2010 Winter Simulation Conference, IEEE Xplore Conference, eds B. Johansson, S. Jain, J. Montoya-Torres, J. Hugan, and E. Yücesan (Argonne, IL). MEA. (2005). Ecosystems and Human Well-Being: Synthesis. Ecosystem Assessment Millenium. Washington, DC: Island Press. Ostrom, E,. (1990). Governing the Commons: The Evolution of Institutions for Collective Action. Cambridge: Cambridge University Press. Parunak, H. V. D., Savit, R., and Riolo, R. L. (1998). “Multi-Agent systems and agent-based simulation,” Proceedings of the First International Workshop of Multi-Agent Systems and Agent-Based Simulation (Berlin; Heidelberg: Springer-Verlag). Poteete, A. R, Janssen, M. A., and Ostrom, E. (eds.). (2010). Working Together: Collective Action, the Commons, and Multiple Methods in Practice. Princeton, NJ: Princeton University Press. Ragin, C. (1987). The Comparative Method: Moving beyond Qualitative and Quantitative Strategies. Berkeley, CA: University of California Press. Shanthikumar, J. G., and Sargent, R. G. (1983). A unifying view of hybrid simulation/analytic models and modeling. Oper. Res. 31, 1030–1052. van den Belt, M. (2004). Mediated Modeling - A System Dynamics Approach To Environmental Consensus Building. Washington, DC: Island Press. Wallin, A. (2012). Factors Influencing Actors at the Interface between the Socio-Technical and the Ecological Systems: The Case of on-Site Sewage Systems and Eutrophication. Division of Environmental Systems Analysis, Department of Energy and Environment, Gothenburg. Copyright © 2015 Martin and Schlüter. This is an open-access article distributed under the terms of the Creative Commons Attribution License (CC BY). The use, distribution or reproduction in other forums is permitted, provided the original author(s) or licensor are credited and that the original publication in this journal is cited, in accordance with accepted academic practice. No use, distribution or reproduction is permitted which does not comply with these terms.